I have always loved the ocean and the sea critters that live beneath. 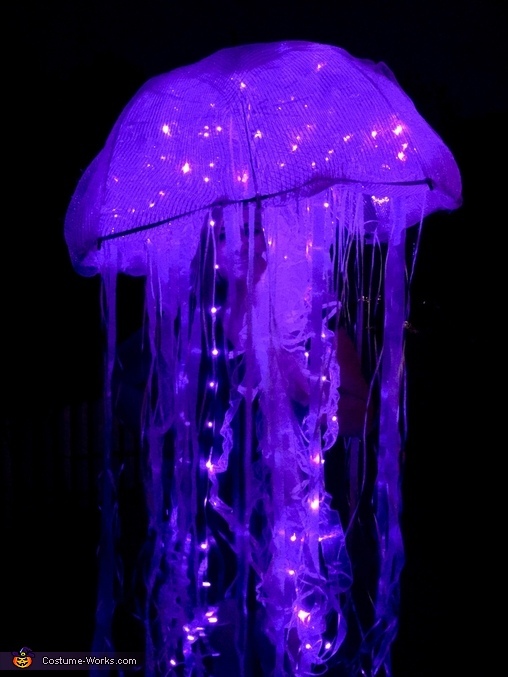 The idea for this costume was based on one of my favorite iridescent stinging creatures of the sea; a jellyfish. Putting together this costume was incredibly fun, but wearing it out in public was even better! 1. Attach 4 strands of battery LED lights to the inside of the umbrella at random spots using the clear tape. Secure the battery packs towards the center metal skeleton. 2. Cut wide pink mesh ribbon to cover the top of the umbrella and attach ends rim of umbrella using plastic hooks. Use two layers to completely cover the umbrella. 3. Tape 4 strands of LED lights at 4 corners of umbrella and leave them hanging down as tenticales. 4. Tie or tape long strands of various ribbon individually inside of the umbrella towards the rim of the umbrella. These are also tenticales. 5. Tie 3 small tutus together in a strand to make one large center tenticale. Attach to the middle of the pole of the umbrella with a plastic hook or tape. 6. You are a luminous jellyfish!